Only in retrospect am I able to pinpoint when I was imprinted with the value of conservation. It was during my early years as the scion of five generations of Idaho ranchers. In the early 1950s, horse and cattle ranchers not only practiced - but were respected - as conservationists. But it wasn’t until my mid-20s in my second year as the CEO of my first community destination marketing organization that I learned from a sociologist and marketing professor how values are formed. In 1976, Dr. Morris Massey of the University of Colorado was giving presentations on his theory of values formation entitled, What You Are Is Where You Were When. Up to the age of 7, I was imprinting values such as conservation from my parents and grandparents, especially my paternal grandfather with whom I spent a part of nearly every day doing light chores on the ranch, until I reached school age. Massey believed that people modeled not only family members but other people between the ages of 8 and 13, including teachers. There is then a “socialization period” between 13 and 21 when we turn more to peers and the media. This is why experts note that people rarely change much after age 15 or 16. Coincidentally, people born after 1976 when Dr. Massey laid down those three periods of value formation, are likely to have imprinted controversial and partisan notions of conservation, especially the now-politicized label of environmentalist. My first DMO was formed by grants from Spokane Unlimited and the City of Spokane in hopes of leveraging the community’s notoriety from producing Expo 74, a World’s Fair for the Environment. It is mind-boggling to most people when I explain today that the origins of that theme came from the local business community. Being concerned about the environment and being business friendly like being an environmentalist and a rancher weren’t considered mutually exclusive values back then. My very conservative ancestors would seem moderate by today’s standards, not because they would have changed their views but because conservatives in general seem to have moved so far right. It is probably why, as an Independent, I am called liberal by my friends on the right and conservative by my friends on the left. I even get holiday cards from both former governor and Republican Presidential hopeful Jeb Bush and President Barack Obama, a somewhat liberal Democrat. Conservation as a movement long pre-dates President Teddy Roosevelt who gave it prominence when he declared it a national duty in 1908 in a speech delivered on my grandfather’s 10th birthday and well into that second phase of values formation. By necessity, before and after that time nearly all ranchers considered themselves conservationists, because it was just good business, something that had impressed Roosevelt during the time he spent ranching prior to his political career. So the value my grandfather imprinted on me prior to turning 10 had been imprinted on him too by that age. A second era of conservation began in 1948, when eight days before I was born, Congress passed the Federal Water Pollution Control Act which was then broadened in ‘56, ‘65, ‘72 and ‘87 as it was this year by President Obama in implementation. North Carolina, where I’ve lived most of my life, appears to have dodged a bullet this month when conservatives, moderates and progressives in the General Assembly rejected a proposal by construction special interests and regressives in the Senate to narrow vegetation buffers along streams and creeks. By the way, the term regressive is not a pejorative. Today it is most often used to describe those few who, when disguised as conservatives, seek not to merely tap the breaks on progress but roll it back. But regressives have long existed at both ends of the political spectrum. This includes a wing of progressives. While giving regressives power is almost always a mistake, it is important to listen to them because so-called progress in some instances turns out to be problematic when taken to extremes. This crossed my mind as we took our old runabout for a spin up Mayo Lake this past weekend. Experts have remarked at how clear that lake is, the clearest in North Carolina, they claim. Some credit is due to a unique vegetation buffer that is protected between homes and the lake shore. But even more important is that wetlands at the mouth of the primary stream that fills the lake are fully intact and ecologically functional. Wetlands such as this scrub the water of pollutants including sediment which is the number one source of pollution in our state, impairing the overwhelming majority of our waterways. For the first time, I noticed a pasture of cattle along a stretch of shoreline on spin around the lake last weekend, north of the Triple Springs boat ramp. It was primarily, but not totally buffered by trees, and was probably grandfathered as an exception when the lake was created in the late 1970s/early 1980s. Cattle can be a source of contamination to waterways too, even when pasture-raised and especially when nitrogen is over applied and then washes into waterways. But don’t jerk that knee quite so fast. Click here for an excellent video on why soil is so critical to solving our climate change threat. Click here for an excellent Washington Post essay on the issue of “grass-fed” cattle and whether they are good for you, the animal and the planet. Grass-fed is a form of regression, a roll-back from today’s massive feedlots where cattle are “finished” using anything but grass. When I was coming up in the 1950s it was the predominant way cattle were raised, including our 500 head. But for anyone dismayed by the havoc regressives have created the last few years in the legislature, it may give hope to look back two hundred years to another era when they held sway in North Carolina. Following the American Revolution and creation of a new system of government, North Carolina spent the first four or five decades of the 1800s in the control of regressives. Throughout the nation, as other states perpetuated the progressivism upon which America was founded, North Carolina earned a reputation as the “Rip Van Winkle” state. Between 1830 and 1840 alone, nearly half of the counties lost population according to a superbly documented book entitled North Carolina Through Four Centuries. The 1850 census revealed that 31% of all native North Carolinians then living in the United States resided in some other state.” Backwardness had driven away more than 400,000 Tar Heels, two-thirds of whom were white. Fast forward two hundred years. Sound familiar? The thing to remember is that during much of that period of regression, a handful of deeply concerned and resilient North Carolinians were persistently advocating progressive ideas that would put “the state on a totally new course,” following the Civil War. They were named Yancey, Caldwell, Fisher, Swain, Gaston, Morehead and Graham. But their architect was Judge Archibald DeBow Murphey who was born in Red House, which is now called Semora, a crossroads just northwest of Hyco Lake, a twin lake just west of Mayo Lake. Here Judge Murphey crafted his plan for North Carolina’s salvation including “establishment of a public education system, construction of canals and turnpike roads, as well as a general public welfare system,” and eventually railroads. In fact, North Carolinians weren’t paying much attention to succession leading up to the Civil War. Many of Durham’s founding generation were heavily influenced by Murphey’s ideas including his close friends the Camerons, who encouraged others in what would become Durham to push for statewide progress such as railroads and a strong banking system. My value for conservation was obviously imprinted by my family but I am also a product of a twenty-eight year period when conservation, ecology and environmentalism were bipartisan values. The partisan demonization of those values over the past 40 years has taken a toll, and yet polls today show that 77% of Americans support stricter environmental protections including 58% of Republicans, the party primarily responsible for their demonization. People who point instead to another recent poll showing that 49% of Americans view government as an immediate threat, need to read more closely the reasons given. 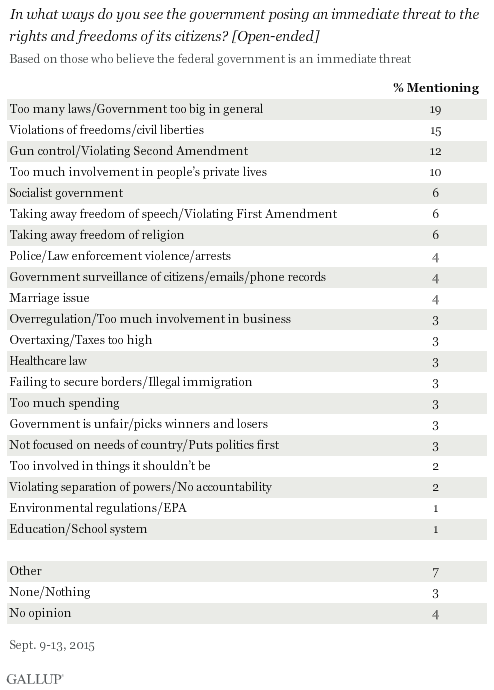 Too big 19%, gun control 12%, law enforcement 4%, surveillance of citizens 4%, overregulation 3%, taxes 3%, illegal immigration 3%, and environmental regulation just 1%. You sure wouldn’t know it from the obsessions in news headlines or by partisan statements by lawmakers. There are even more Americans who are concerned that government isn’t doing its job. Inconvenient to journalists and reporters and bloggers for that matter is that people can hold contradictions. In fact, news stories miss an important point. When people disagree, it usually isn’t about a specific issue, such as being for or against billboards or trees. They just hold different values.